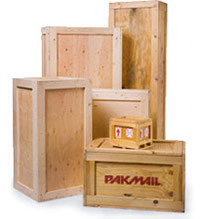 Pak Mail of Jonesboro offers a wide variety of crating services including packing services and custom crate building. We will pack and crate your items to meet strict industry standards using only new unused packing materials. This insures your items arrive safely, no matter how fragile they are or how far they may be going. In the rare case of shipment damage Pak Mail offers declared value coverage on all of your items. With Pak Mail, you can feel comfortable knowing we care about your shipment as much as you do.